Netflix’s Chilling Adventures of Sabrina season 1 episode 8 opens with a cave in at the mine, caused by Agatha and Dorcas in the previous episode. Harvey is pretty banged up, but manages to get out alive. Tommy and a group of others are still trapped in the mine, and Harvey is determined to go in after them. Volunteers from the town rally to help until Harvey’s father arrives and tells everyone to go home. Harvey is furious that his dad isn’t even attempting to rescue the trapped miners. Ambrose tells Sabrina that he astral projected into the mine and that there are no survivors. Sabrina’s friends continue to be helped and haunted by their ancestors and personal demons. Harvey blames himself for Tommy’s death because he ran when Tommy told him to run away. Harvey walks in on his father and a banker the morning after the mine collapse. His father isn’t going to continue a rescue, opting instead declare Tommy dead and bury an empty casket in order to collect insurance money. Harvey and his father have a falling out at the funeral. Sabrina wonders how Harvey will live in the same house with his father now that Tommy is gone. During the initial rescue attempt, Susie is told by a vision of her aunt Dorothea to go into the mine and fit into a space too small for the others. While she doesn’t find anyone, she does retrieve Tommy’s battered and bloodied helmet. That night, Susie reveals to a vision of her aunt that though she was scared, it felt really good to prove her worth. At the funeral, Roz touches the helmet and has a vision of the Weird sisters Agatha and Dorcas causing the collapse. Roz tells Sabrina about her nana’s theory about her family’s blindness being caused by a witch’s curse and the Cunning. Faustus visits the Spellman home in order to convince Ambrose to give up the names of the others witches who were involved in the failed attempt to rob the Vatican that led to Ambrose’s imprisonment. While there, Zelda prostrates herself before Faustus, confessing that she is failing in keeping the family on the Dark and narrow path. Faustus commiserates that he, too, feels frustrated as it relates to his wife, and the pair share a tryst. Faustus returns to get Ambrose’s confession. Ambrose, however, will not give up the names, which Faustus appreciates. Faustus offers to have Ambrose work for him at the Academy as a sort of community service and the beginning of a pardon process. Zelda shows Faustus a portent that Lady Blackwood will have twin sons. Zelda expects the affair to continue, but Faustus rebuffs her, opting for the pair to flagellate one another with whips, both in punishment and in pleasure. Sabrina questions the nature of life and death. She goes to Prudence, who is on the outs with her sisters, and the two formulate a plan. 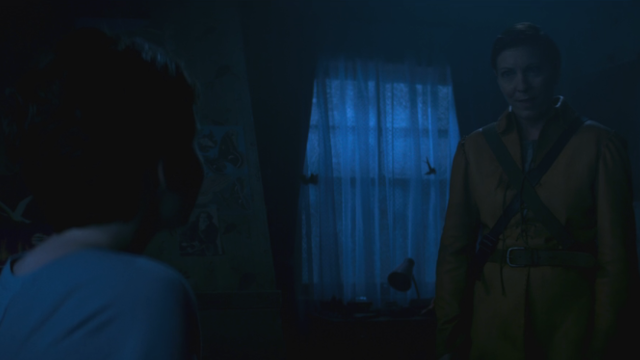 With Wardwell gently guiding and watching from the shadows, Sabrina uses necromancy to try and return Tommy from the dead, using Agatha as a blood sacrifice and exchange. The group then buries Agatha in the plot at the Spellman Mortuary where witches are resurrected. Sabrina thinks she has cheated death by returning both Tommy and Agatha, but hours after Tommy should have returned, he’s not back yet. Ambrose chastises Sabrina for meddling in Dark Arts she knows nothing about. Instead of Tommy’s soul returning to the effigy that Sabrina concocted, the soul returned to his body still trapped in the mine. Sabrina goes tot he mine and finds that the boards blocking the entrance have been broken. At the Kinkle house, a dark form bangs incessantly on the front door. 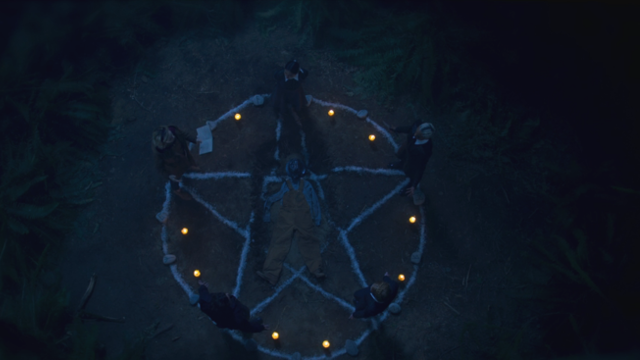 What did you think about Chilling Adventures of Sabrina season 1 episode 8? Let us know in the comments below! The post Chilling Adventures of Sabrina Season 1 Episode 8 Recap appeared first on ComingSoon.net.